← A “P.S.” From John Vonderlin is NEVER Ordinary…. 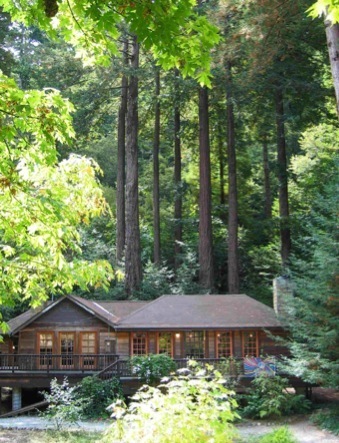 When I was writing a historical column for the San Mateo County Times in 1997, “One Flew Over The Cuckoo’s Nest” author Ken Kesey put a “for sale” sign in front of his famous log cabin nestled in the redwoods of La Honda. I never met Kesey but, like many others my age, he made a big change in my life by writing “Cuckoo’s Nest.” Of course, it was a great book that fit in with the theme of the times, a great and ageless message: that it was okay to be you. I never met Kesey but I wrote about him and even to him, receiving a wonderfully creative response in return. I also drove past Kesey’s cabin many times on my way to Loma Mar or to the more secluded Coastside beaches. The home had it’s own “sense of place,” with a small, funky wooden bridge that allowed the person on foot easier access across the, what? The big gully? I can’t remember. In his “Electric Kool-Aid Acid Test,” book, Tom Wolfe described the scene as worthy of a Christmas card and when I think of Kesey’s house, that’s what I see. Kesey’s home, where the colorful Merry Pranksters hung out (and who were not afraid of being themselves) was going for $239,000. Rumor was Kesey didn’t want to leave but he might have been encouraged due to an unfortunate accident involving a county sheriff who fell and injured himself on the property. I haven’t met the Terry Adams family, the new owners , but they understood they were purchasing a precious piece of 20th century San Mateo County History. What greater homage to Ken Kesey, than this beautiful website, including “Prankster House, Hippie Empire, Psychedelic Mecca, Dragons, Wynchwood”…and more… click here. This entry was posted in Ken Kesey, La Honda, Terry Adams. Bookmark the permalink.